As an experienced woodworker you have probably discovered this problem: to reliably and accurately center the pilot holes for mounting hinges and other types of hardware. Normally you use an awl or punch to mark the hole centers, but after drilling you often find that the bit did not track properly and the hole is no longer centered. Especially with wall hardware like stair railing mounts, for instance or visible hinges in cabinetry, even slightly off-set pilot holes can leave screw heads tilted and projecting above the counter-bored mounting holes and leave the impression of a sloppy job. 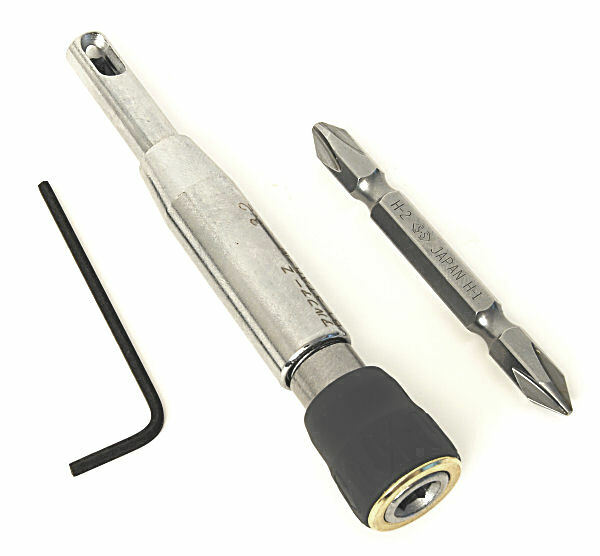 These Hinge-Locating Center Bits will help get the job done right, quickly and easily. 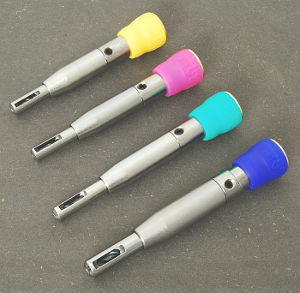 The tool includes a 2 mm hex key to install drill bits and a double screw driver bit PH1/PH2. Made by Star-M in Japan. You can of course use any standard-sized double bit in the tool, so there are no restrictions on the types of heads of the screws that can be driven with the tool. Insert the double bit into your drill or drill press and tighten the chuck. Slide the sleeve of the housing over the free end of the double screwdriver bit. Fix the hardware in place and drill the hole for the hardware you would like to install, being careful to allow the housing to center itself in the countersunk hole. Use the screwdriver bit to drive the screw into place.